Tie scarf and Ascot scarf are usually worn with a shirt with open collar - i.e. in combination with a suit, blazer or a sporty jacket. But an Ascot scarf or tie scarf can also be combined to a cardigan, polo shirt or even a sweater with a crew neckline. When wearing a modern silk scarf, any rather casual outfit can be greatly enhanced. Ascot scarf and tie scarf are a very beautiful alternative to the classic tie and bow tie. Especially the ascot fits pefectly for ceremonial occasions. It is the more classy version of the tie scarf and is often worn for weddings. Combined with a tuxedo the ascot can even replace the obligatory bow tie. The Ascot scarf is cut like a tie. Characteristic is the tapered wide end on one side and the narrow end with sewn loop on the other side. In all models, the silk of the selected design will be used on the inside as well as on the outside of, and no cheap deco fabric is used. Compare! 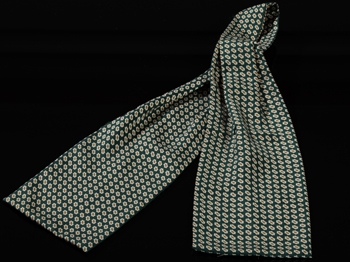 The Ascot scarf is worn loosely tied under the shirt collar and with a jacket or suit. Once tied, an ascot does not slip through the fixation in the loop. Both, an elegant business outfit and a festive evening wear are perfectly complemented by wearing an Ascot scarf. The tie scarf is double-sided, with pure silk on the inside and outside. The ends run straight, the middle part with the neck piece has a narrower cut. 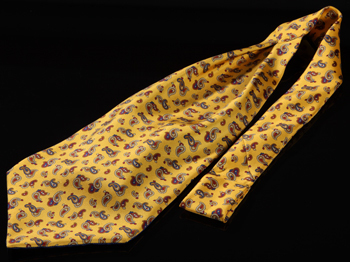 With a length of about 122 cm (48 in), the tie scarf can be wonderfully tied.